Homeworld: Aztlant is a forbidden planet located in the outer rim of eye of terror. The Aztlanti are a fierce brown skinned people who build great pyramids and cities despite their barbaric nature. The Aztlanti cities war constantly with each other at the behest of their shamans and openly practice blood sacrifice to the emperor. Once a year the Blood Eagles descend to their fortress temple in mass as the young boys from each city are sent to fight in gladiatorial duels to see who are chosen. To reach the great temple the young men must travel through the jungles fending off attacks from mindless savages and the feared Aztlant Jaguar, a creature whose speed, stealth and might are even cause for concern to lone space marines and the mighty constrictor snakes who reach up to 30m in length. The boys who survive and aren’t chosen often return home to become Shamans of their city leading the next generations into the bloody service of the emperor. The Blood Eagles live on Aztlant’s only moon and it is dominated by their fortress. History: Administratum records first record the Blood Eagles in M36 as part of the confederation of light fighting alongside the other Astartes under Sebastian Thor’s banner. At the time they were a fleet based chapter and it wasn’t until later that they took over the world of Aztlant. The Blood Eagle’s aren’t widely known due to the fact that most of their crusades take them far outside of the Imperium striking at enemies of man before they can march on the Imperium before they joined their brothers in helping to defend against the threats from the eye of terror. 758.M41 the whole 2nd company was lost during a fight against the world eaters lead by the vile Kharn. 815.M41 the Blood angels have given their 3rd company to the Achilus crusade and have sent their first troops to the deathwatch to honour the ancient oaths. While they are a codex chapter they differ in one main way. They have no scout company their scouts are chosen and trained from their tactical marines and all don the mantle of the Jaguar Warriors like their ancestors. The veterans of the company are arranged as the Eagle Warriors who don feathered capes from the great Quetzals, Giant colorful birds from Aztlant. Like their founding chapter they have a death company for the black rage and the red thirst grip them as bad as it does the Blood Angels. The Tradition weapon of the Aztlanti is sometimes compared to the sword, and it is a powerful, close combat weapon. Made from wood with shards of flint on Aztlant the Blood Eagles make theirs from Ceramite with Blades of Adamantine. The Aztlanti are bloody people and this crosses over to the Blood Eagles and is enhanced through the red thirst they gain from their founding chapter. This causes them to seem intense and short tempered outside of battle and only when the blood of their enemies stains their armor do the Blood Eagles seem at peace with their inner rage and only to feel the hunger worse once the battle is through. Blood Eagles us the same solo mode and squad mode abilities as their parent chapter. A picture of their armor for a tactical marine I whipped up. Still working on the chapter symbol. Reminds me of the Blood Jaguars. I was unaware of the blood Jaguars when I created it. Interesting. I was originally going to model them off the Maori due to the whole red thirst problem. Interesting, too many colors for my taste though. I'm currently writing something similar, a chapter based on the Aztec culture. I've gone for a less literal parallel to the Aztec though. If I had talent as an artist the picture would be better, but as it stands the painter is all I've got. I would have liked to worked out a Jaguar Scout or an eagle warrior. As someone from Southern California, with a mixed ancestry of Native and mestizo blood in me, this brings me joy. Well done. With your permission I would like to feature some of the Eagles in my campaigns. Go ahead if I didn't want people to use it I wouldn't have posted it. That is basically what I figured, but it never hurts to ask. That would be interesting, but it wasn't my point. What I mean to say is, there is no one central color to the armor. You have four colors, two of which are complimentary and clash with each other, all pretty evenly distributed. What is ideal, at most, is a primary color paired with an strong accenting color that may be supported by other accents. The best example I can think of is the Space Wolves. There you have blue-gray as a primary color accented by yellow, black, red and white. There can also be a wealth of other colors as secondary accents: browns for fur and leather, blacks, whites and grays for fur, gold for metallics and off-white for bone. The thing that makes that color scheme work is the fact that one color is dominant. If the Space Wolves were painted like your chapter, they would be very awkward to look at, which is the impression that I get when I look at your scheme. I agree that a simpler color scheme would probably work better. I think green and gold most closely evoke the aztec warrior images I've seen (and pulled up with google images as a refresher). I'm glad you decided to include the Maquahuitl - it doesn't get enough love. If you gave it the balanced property, it would be identical to a Chainsword (per living errata). I wouldn't suggest making it identical, but since you've given up the balanced property, I think you could increase the damage to 1d10+5. As per suggestions here is the new colors. The colors are just green, gold and red. The black is from the fact I made him 5th company and thats the 5th company color. The stats for the Maquahuitl are based off the ceremonial sword from the core book and given the tearing quality over the balanced quality. 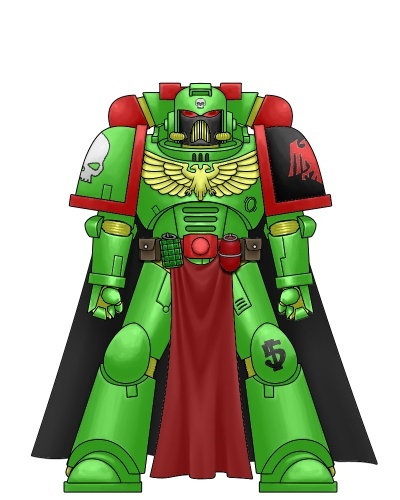 What program are you using to create colo schemes for your Astartes? 100 times better, I like it. thank you I'm sketching out a short story using the chapter. Just need somewhere to post it since the story wont be deathwatch related. Making up a version of the spear in this image could be the central feature of your Chapter Iconography, possibly: http://www.mnartists.org/work.do?rid=30316 Maybe adding stylized wings to tie in the "Eagle" motif as well as tie in a representation of the Imperial Aquilla signifying the Empire of Mankind.....either on a field of red (symbolic of the "Blood" portion of the warcry/motto) or with specific blood red highlights. Using (suggestion) the stylized spear as the body and adding appropriately themed/styled wings. The second rendering is far less busy than the first one. 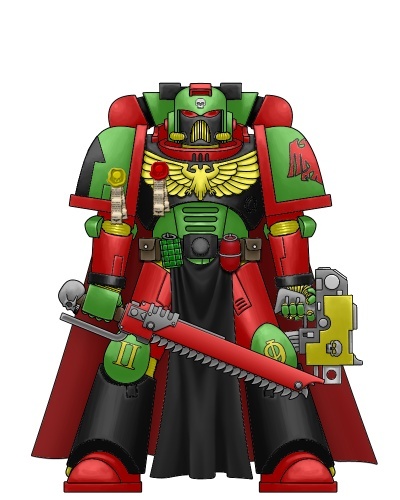 Since you have a "Blood" element "for the Emperor", I might go with a red helmet, keeping the black face and changing the eyes to green. Also, I might add red fists, symbolic of the ancient blood sacrifices where the bloody and still beating heart was removed from their sacrifice and raise by hand in presenting the offering to the heavens and their God(s). Increase the use of gold in your ranking and leadership individuals to set them apart from the rank and file Marines. Perhaps using greenstuff and adding on "eagle feathers" instead of the standard purity seals or to indicate reward/recognition for specific deeds/actions that were above and beyond the call or as additional indications of ranking members. Arm band with a specific number of feathers for a Sergeant, more for a Captain and obviously a flamboyant variety of options for your Librarians AND Chaplains. A large eagle skull atop the head or helmet, a feathered cloak, Crozius with an eagle head/skull and wings or a spear (instead of a staff for the Librarian) styled like the spear in the linked picture decorated with feathers and so on. Maybe look to the WFG Lizardmen army for appropriately themed bits and so ideas. Your Army, do what you want. Thanks for the ideas. I had thought of using the tepoztopilli (Aztec spear) for the librarians. I like a lot of the ideas in the last paragraph, the red gauntlets is good, but I think i'm going to use that for the apothecaries or also the librarians. On a side note if I had any artistic talent the rest of these would be pretty good too. eBay or retail/online bits shops could help out your efforts. There is a SM backpack with eagle heads that could be used for several things. Intact for your ranking Marines, cutting off the heads to be used as staff heads or the Crozius for instance. Lizardmen Shaman staff heads and assorted other bits could easily be used to "flavor" your army as well. Using the spears for instance straight up, or even shortening them a bit to be used to replace the swords of some of your Marines as their CC weapon. if you REALLY need some help creating/making a Chaplain, PM me when the time comes. I may be able to help you out. Give me a little time though because most of my existing available bits don't currently match what my mind has envisioned.